It's like I'm still stuck in last year's Autumn, seriously. With early Spring trip to Italy, I had to put my nose into a giant KIKO store right after I equipped myself with a MAC shopping bag. With guilt on my shoulders and previously mixed feelings for KIKO Cosmetics, I still managed to grab a thing or two in season-not-appropriate colours. Instead of picking bright and light shades, I went with old trusty rich browns, with a hint of mauve. Feeling like a proper rebel now. Cream Crush Eyeshadows are freshly baked cookies at KIKO stores. No, they're not food but highly pigmented mousse cream eyeshadows with long lasting effect. Truthfully, cream eyeshadows are one of the among things I truly like from KIKO. Cream Crush pots are creamy, almost fluffy and mousse-like while they set and don't budge for hours. A big like from my side, I wish I've could have picked a couple more - 04 Mat Taupe and 01 Pearly Vintage Rose in particular. Negative aspects? You need to blend them quickly and efficiently. 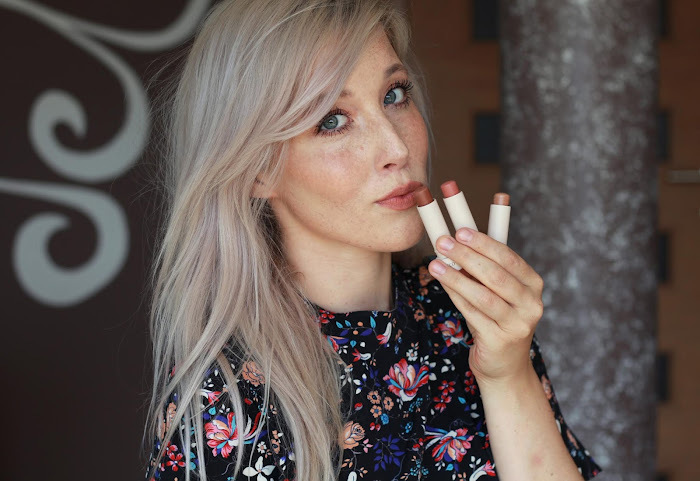 Highly praised by beauty community, I had to check out what's all the fuss around them. Rosy Brown seemed like a perfect cool brown with rose undertones and lots of shimmer. Frankly enough, these are super creamy and highly pigmented with one swipe but they do crease a bit. Not a lot, it sort of seems like the color payoff somehow disappears with blending action. They do set quite well for an pencil eyeshadow and I like to top Rosy Brown with powder eyeshadow. They give a lot of dimension with layering but they're not my first call for individual use. In the store, I was convinced I'm buying the most creamy balmy lipstick ever. I was so impressed by it's creaminess and color payoff, I had to have it immediately. Applied on the lips, it was a totally different story. 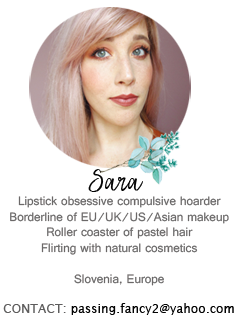 I should have pay more attention to the description in the store but blurred beauty blogger's mind isn't really functioning in beauty stores. With first creamy swipe on my lips, lipstick started quickly to change into a solid matte finish. With a bit of leftover stickiness and fully matte lips, I was pleasantly shocked. It's still comfortable yet matte. Leaves a familiar stickiness as all ''moisture mattes'' but it's not really that disruptive. In general, I still really like it (KIKO Velvet Matt on the other hand left me disappointed) and it's a perfect Cocoa matte color for cold season (scarf was a ''must'' accessorise in this swatch, okay?). 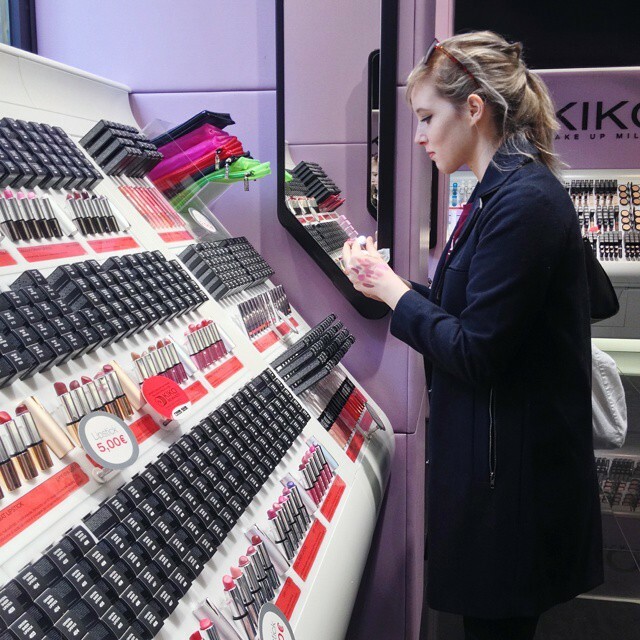 In general, KIKO Cosmetics can be a hit or a miss. I've been struggling with some of their lipstick formula's (Velvet Matt) but I love their cream eyeshadows, bronzers and eyepencils. I also love on trend collections and gimmicky products. For face products, let's just say I'm not totally familiar with base items but I'm left cold hearted looking at their blushes. You can shop KIKO Cosmetics online with affordable shipping costs. Oh my...too bad. Although you're not missing anything spectacular, I'm sure you can find a similar shade in Korean makeup. Tole kremno senčilo me pa zelo mika :) Res bi mi prav prišlo več rjavkastih mat odtenkov. Vse tri bi imela:) Cream Crush Eyeshadow - odličen odtenek. Kako se ti zdijo v primerjavi z Maybelline Color Tattooji? Hmmm...hitreje se posuši, bolj prekriven, manj silikonast in mousse tekstura. Meni je čudovit, včasih uporabim tudi samo za v ''crease'' in lepo počaka. Like eyeshadow stick the most. Haha I am totally still stuck in Autumn too! Can't seem to get enough of mauves and nudes. I love your description of the Cream shadows as 'freshly baked cookies' - so cute! Really loving the shade you chose it in too! You picked up some lovely products! I really want to try their cream shadows, too.